Rotherhill Developments superb Crosslink 646 scheme just south of Loughborough and north of Leicester off the A6, has given the East Midlands industrial and distribution market a terrific start to 2019 as their agents Tim Gilbertson of FHP and Mike Allwood of Andrew & Ashwell are delighted to announce the completion of the first two deals on the site. 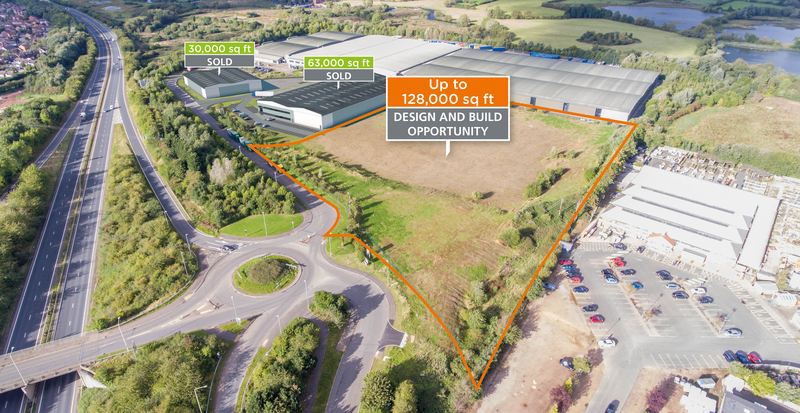 Freehold design and build sales have been agreed which will see two units developed on site, with work starting now for buildings of 29,000ft² and 66,000ft². Both of these deals will see local Leicestershire based companies expand into purpose built accommodation, one for warehousing purposes and the other for both manufacture and distribution use. “What a great start this has been to 2019! When asked to start marketing this scheme we knew it was a great opportunity, Leicester, Loughborough and indeed Leicestershire as a whole are starved of good quality production and storage space and Crosslink 646 has certainly filled the hole as we anticipated. The 66,000ft² unit will be delivered for occupation in Q3 this year with the smaller one to follow for our manufacturing occupier later in the year. The great news though is that we still have a further plot available where we are looking to develop out a unit of up to 128,000ft² which again can be purchased or rented. With the strength of the market it is entirely possible that we can carve up this plot as well to offer smaller units but already have a number of discussions ongoing with potential occupiers for over 100,000ft² and with the forthcoming activity on site we very much hope that these enquiries will develop quickly.